Stripped down model that will suit all of your crosscutting needs. 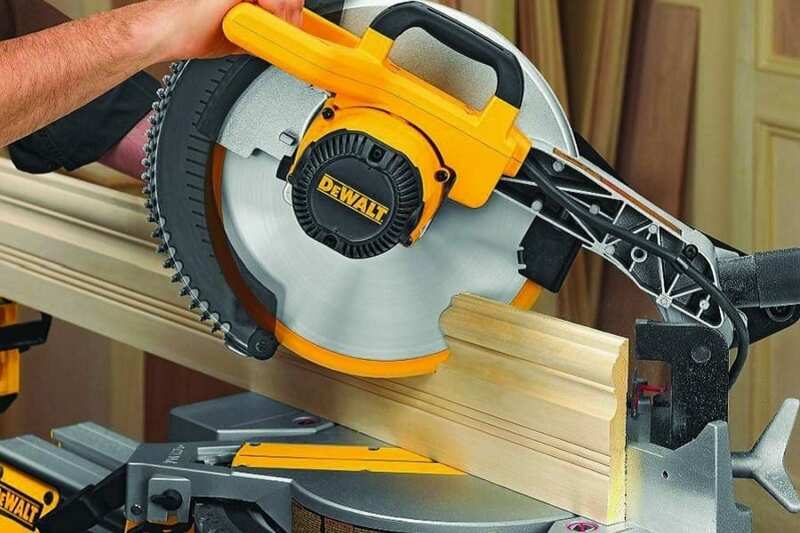 I’m a big fan of DEWALT products in general, and that’s especially true with their power saws. While they do make some deluxe products that are full of modern features, you can still easily find stripped-down models that offer everything you need to get the job done, and for a great price. That’s probably the best way to describe the DEWALT DW715. 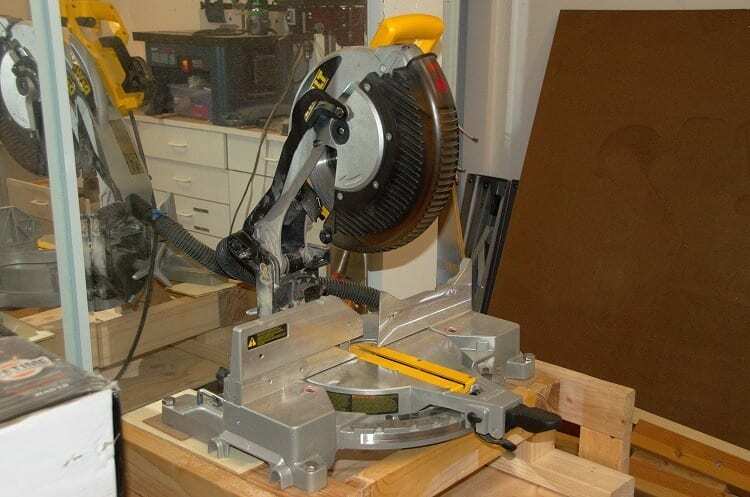 No ultra high-tech bells and whistles with this miter saw, but you do get a light, sturdy, powerful, and versatile saw that is equally at home in your home shop as it is on a demanding job site. Those who need something bigger and more capable than smaller, compact miter saws will find a lot to love about the DW715, as it performs on an incredibly high level, but without taking up a ton of space, or being so heavy that you need help moving it. The DEWALT DW715 single-bevel compound miter saw is powered by a strong 15 amp motor, which generates a very solid no-load speed of 4,000 RPM. This helps it make cutting framing or molding smooth and easy, along with several other crosscutting and miter-cutting tasks. The saw has a surprisingly low weight, clocking in at a very manageable 42 pounds, and it even comes with a convenient carry handle that makes toting it around much easier. The weight is distributed well, so it’s not an awkward carry. The miter system utilizes an adjustable stainless steel detent plate that comes with 11 positive stops for fast setup, helping you keep the work flowing without stopping to readjust all the time. Its cam-lock miter handle does the same for miter angles while allowing for detent override. This lets you configure the miter setting without the saw slipping into the miter detents. The DW715 has a fairly wide miter capacity that enhances versatility, ranging from 0 to 50 degrees to both the left and the right. The saw’s tall fence design can support 5-1/4-inch crown molding nested vertically, and also 6-1/2-inch base molding set vertically against the fence. You can quickly slide the fence out of the way whenever you need to make some bevel cuts. Speaking of bevel cuts, the DW715 can give you very clean and precise 45-degree bevel cuts through any dimensional lumber that measures up to 2 by 8 inches. You can also set up bevel cuts that ranging between 0 degrees and 48 degrees to the left, and between 0 degrees and 3 degrees to the right, giving you the capacity for bigger jobs when needed. Hardened steel bevel stops at 0, 33.9, 45 and 48 degrees add to the DW715’s overall versatility, while letting you find common bevel angles in no time at all. Oh, and the saw does come with the standard inclusions: a carbide blade, dust bag, and blade wrench. One of the main things to appreciate with this saw is how it sort of bridges the gap between smaller, less-powerful models and the larger miter saws that are more geared for heavy-duty use and huge workpieces. The mid-range weight is appreciated by anyone that plans on having to pack up the saw and bring to and from job sites, or when you simply need to move some things around in the shop. The carrying handle is a nice plus too, as it has the perfect location for weight distribution. You’ll also notice a very solid angle adjustment feel thanks to the detents. The saw’s angle locking mechanism has a sturdy feel, and all adjustments are very quick and allow you to keep working seamlessly without having to stop and spend annoying amounts of time reconfiguring when needed. The saw’s horizontal handle and positive trigger contribute to the smooth, stable, and in-control feel that makes the DW715 operate so smoothly. This is probably not a surprise, but the dust bag is not the most effective thing in the world. More dust flies around then actually ending up inside the bag. Most people can simply find a way to rig a vacuum tube to the port, and call it good. Also, if you’re working outside with eye protection, the sawdust won’t be the much of an issue anyway. If you’re a fan of using lasers to help guide your cutting, you’ll be disappointed to find out that the DW715 doesn’t have one, and it also won’t accommodate other DEWALT laser guides, so you’re pretty much on your own. The old-fashioned types won’t mind, however. The DW715 is a perfect in-between miter saw, that is, great for professionals and great for novices working on projects at their own home. This is a step up from some of the smaller, less powerful miter saws out there, and without much of a jump in price. 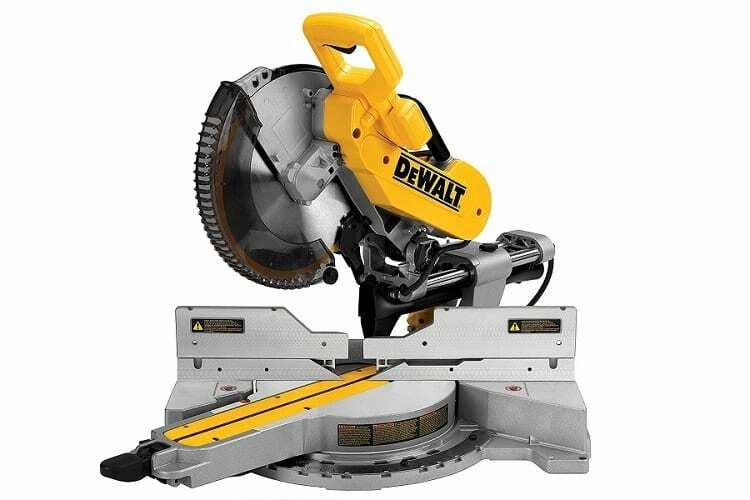 The DEWALT DW715 is just another example of the company’s ongoing commitment to putting out superior saws that focus on all the right characteristics, while still giving a nod to convenience and versatility. For under $250, you’re getting a saw that works and feels like it’s near twice that price. If you prefer basic saws with minimal extra features, but lots of power, cutting range, and durability, the DW715 is perfect for you.